Simple to use. Excellent light and wash fastness. Ideal for hot dyeing of fleece or of spun fibre, using acetic acid. Easy to blend colours to get the shades you need. Also suitable for nylon. We sell wool and silk dyes in Sizes 25g, 50g, 100g, 200g, 500g or 1kg. For a price list and colour chart go to our Downloads page. If you would like to download a full guide to dying wool and silk using Teri Dyes products please go to our Downloads page. 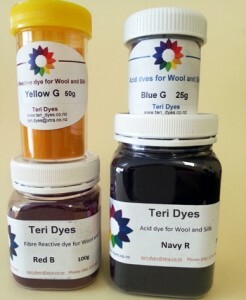 To purchase our animal fibre and silk dyes please visit our store.